• There are 106 rooms and suites. • Restaurant, bar, and brekfast in the room. • Some conference facilities, a hydro maasage pool, a sauna, a solarium, a fitness center, a spa, a massage room, a hot tub, a library, a Turkish bath/steam room and a bycle rental. • Located front of the sea on Viareggio’s Viale Giosuè Carducci Promenade. • 1923: Opening of the Hotel under the name « Select Palace Hotel ». • 1925: Extension of the Hotel two more floors creating the famous facade of today’s Hotel. 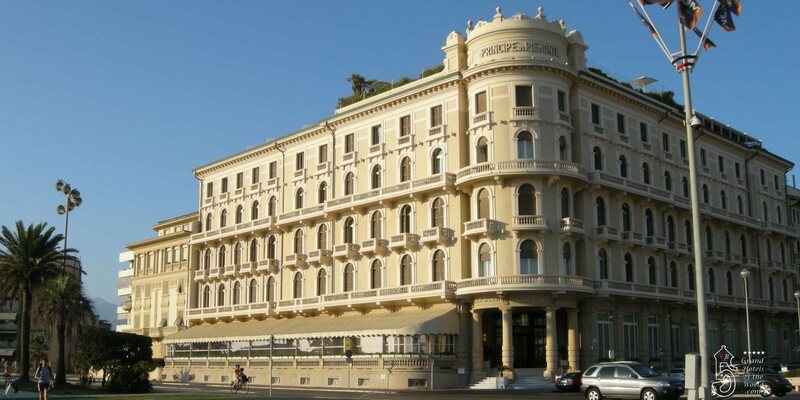 • 1938: The Hotel was renamed « Grand Hotel Principe di Piemonte ». • 2004: Renovation of the Grand Hotel.